This week I'm honored to be the the featured interview on the Blau Exchange, hosted by Paul DiPerna. The Blau Exchange Project is no longer active. The interview can be seen here. The Blau Exchange Project was a web-based initiative intended to be an intermediary for professional groups interested in how information and communications technologies (ICTs) affect society, with particular focus on the Internet and World Wide Web. This project honors Peter Blau, one of the 20th century's most influential sociologists. In April the nation will be celebrating National Volunteer Week in a variety of publicity efforts. I'd like to encourage people to give recognition to those who volunteer their talent to help a non-profit organization expand its capacity. So many of the images of volunteerism are direct service, such as mentoring a kid, building a house, cleaning up trash, or feeding the hungry. Millions of people are needed in these roles, but many others may be left out of volunteerism because these roles don't appeal to them, or they can't work them into their schedule. Yet, these people have a huge reserve of TALENT that could be helping create videos for non profits, or doing fund raising, or building web sites or maintaining web server networks, or doing accounting. Most non profits are constantly challenged to find the money needed to pay for these talent roles, and many donors only want to fund direct service. Thus, if our volunteer recognition can begin to also recognize the talent volunteers offer, we can open up a new channel of service opportunities. Do any of you know of public service campaigns that seek to recruit talent volunteers? If so, please share that information. If these ideas appeal to you, why not try to attend the Tutor/Mentor Leadership and Networking Conference on May 17 and 18 in Chicago. Page 5 of the March 14, 2007 Chicago SunTimes printed the photo of an 11 year old boy who was shot Tuesday afternoon while he was riding his bike. Four boys were being questioned about the shooting, according to the report in the paper. This story was not important enough to the editors of the SunTimes to make the front page, or the editorial page, but we'd like you to know the REST OF THE STORY. The neighborhood where this shooting took places is in the 60619 zip code, in the far South part of Chicago. 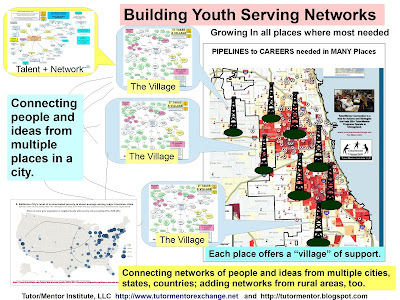 If you search the Program Locator of the Tutor/Mentor Connection web site, you an find listings for park districts and other youth serving organizations in this area, but little evidence of comprehensive, volunteer-based tutoring/mentoring programs such as Chicago Youth Programs, Inc, which operates in three park district locations in other neighborhoods of Chicago, or the Midtown Center which hosts programs in the central part of Chicago. Stories of shootings are reported in the Chicago papers almost every day. Seldom do they get feature attention, or editorial attention. Seldom do the papers feature editorial columns which encourage volunteers, donors and area businesses to mobilize volunteers and resources to help every neighborhood have a full range of programs that are as comprehensive as Midtown or Chicago Youth Programs, Inc. I mention these two programs not because they are the best, but because they have web sites that I can point to where they show what they do, and that others can learn from in building similar programs in different locations. In the Chicago Programs Links you can find links to other programs in the Chicago region. Unfortunately, we can't find many programs on the South Side of Chicago, or in the South Suburbs, with web sites that show a range of mentoring, tutoring and enrichment services. This can mean there are programs, but they don't have web sites. Or it can mean their are no programs, and this is a reason kids are out on the streets shooting at each other. If the shooting of an 11 year old boy is something that angers you, and you want to do something to prevent this in the future, search the Program Links and review the concept essays in the Tutor/Mentor Institute . Use this information to begin to learn more about tutoring/mentoring in Chicago and where your time, your talent and your dollars can help build programs that provide more positive alternatives to the choices kids have now. In a previous post I provided a graphic intended to encourage people to think of the day in three segments, of school hours, 3-5 after-school hours and after 5pm evening hours. In another I posted a graphic encouraging business leaders to point to school based, and non-school programs, when encouraging employees and customers to be volunteers or make donations. Today I'm making another effort to encourage out of the box thinking. By that, I mean, let's think of solutions that are not focused at the school building or school day as being the only distribution channel we need to reach kids, build aspirations, and help them learn what they need to know to go through college and enter jobs and careers. In a variety of forums such as at Omidyar.net I'm meeting people who are innovating ways to connect networks. Today I talked with Richard Cherwitz, of the University of Texas. Dr. Cherwitz is an innovative thinker who seeks to "encourage academic engagement and collaborations across disciplines within the university community, as well as collaborations and partnerships with community that might produce solutions to society's most vexing problems." In another post I've written about an advocacy project of the UCLA Center for Mental Health in Schools. The leaders of this movement are basically saying that all the money spend on the government funding of No Child Left Behind won't have the desired result in high poverty neighborhoods because this money does not also fund the learning supports that are so important to help kids be able to learn and succeed in school. While this is one of the most focused efforts I've seen, it still is not out of the box. It focuses on efforts that reach kids in the school, during the school day or right after. It does not focus on all the other people and activities that can mentor learning, or on the role of businesses in pulling kids through school and into careers. In other articles I illustrate the use of maps to focus attention, and resources to every poverty neighborhood of the Chicago region, rather than to just a few visible areas. If generals in war can use maps to point troops at enemy territory, why can we teach leaders to use maps in our war on poverty. My goal in using graphics is that they convey ideas more clearly than words. In a section of the T/MC web library, I post numerous other examples of how visual tools can aid innovation and collaboration. As I write, my goal is that visual thinkers at universities and in industry, and others who are involved with complex problem solving, will respond to the vision of Dr. Cherwitz and reach out to help the Tutor/Mentor Connection in its efforts to create an army of leaders who think out of the box, and are willing to connect, collaborate, learn from each other and in short, build a better operating system for helping kids living in poverty connect with mentors and learning resources that help them move more successfully through school and in to careers. 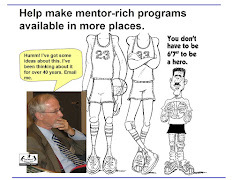 Steve Habib Rose, who writes at a Neighbor Networking blog has introduced the Tutor/Mentor Blog Exchange at his site and is helping recruit others via the networking we do on the Omidyar.net forums. I added the Give & Take Blog from the Chronicle of Philanthropy to my list of links today. Because of the visibility the publication received, I think it will be a resource used by many people. Hopefully, it can connect donors and non profit leaders in discussions of how they merge their talents to archive long-term goals. I also added a link to a blog exchange strategy and the new conference web site. While the Chronicle of Philanthropy has links to non profit and philanthropy experts, I've yet to find a listing of bloggers who focus on volunteerism, tutoring/mentoring, education to careers, and the business and private philanthropy needed to support such programs in many places. While I have many links to organizations who are involved with this work, the goal of the Tutor/Mentor Blog Exchange, and the conference, is to get these people to exchange ideas and interact with each other. If you blog this topic, I hope you'll join us in May/June 2007.